a timely stamp received this week for Sunday Stamps II for a flower symbolizing purity, beauty, majesty, grace, fertility, wealth, richness, knowledge and serenity. 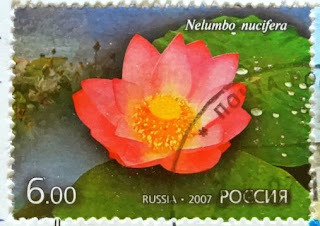 Nelumbo nucifera is the Latin name for Indian lotus, sacred lotus, or simply lotus. The lotus flower is associated with purity in Buddhism and beauty in Hinduism and only grows in pink and white colours. Its flowers, seeds, young leaves and rhizomes are also all edible. In Asia, the petals are sometimes used for garnish, while the large leaves are used as a wrap for food. Even the stem is edible and in India is sometimes pickled. The Lotus is an aquatic perennial and grows in muddy water on a stem that is up to 2' tall. Under favourable conditions its seeds may remain viable for many years, with the oldest recorded lotus germination found from seeds 1,300 years old recovered from a dry lakebed in northeastern China. 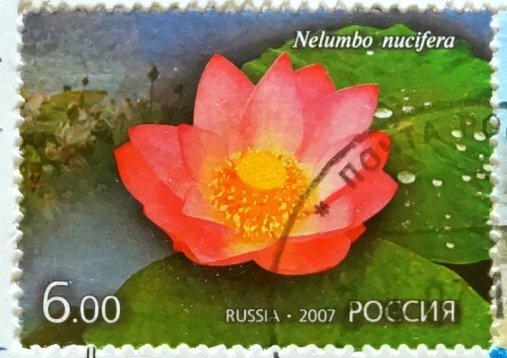 I'm always amazed by the seed pods of lotus flowers - thanks for sharing this lovely stamp. I've also now learned there is a vast difference between the lotus flower and the water lily! Very pretty stamp. I didn't realize that they were edible. Very interesting fact. It is so hard to get the right shade of pink to show in a photo!